Primm, Nev. - The College of Coastal Georgia men's golf team figured to be a good bet to win this week's NAIA Battle at Primm. 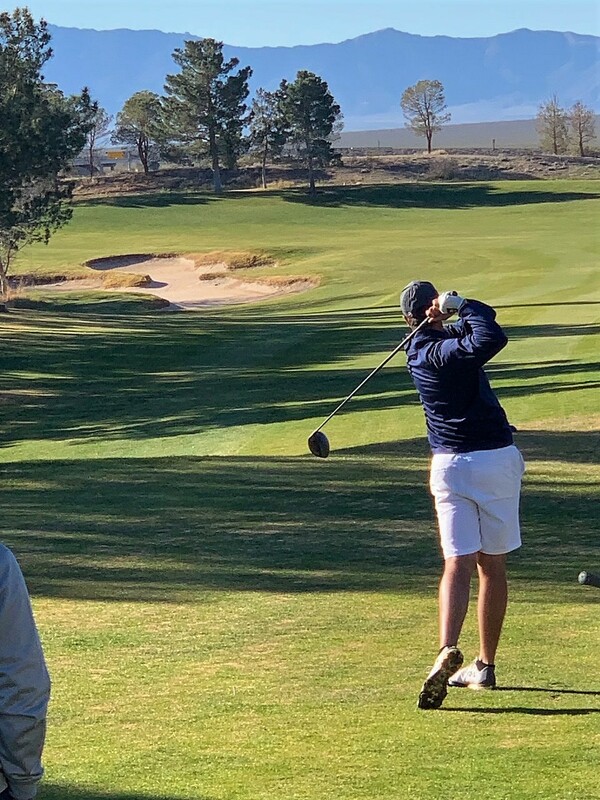 And after a long opening day in the 54-hole tournament at Primm Valley Golf Club on the outskirts of Las Vegas, the Mariners are indeed on top of the scoreboard following the first 36 holes of the event and are 18 holes away from another tournament title. The nation's second-ranked team posted a 554 total over the first 36 holes of play on Monday to grab a three-shot lead over top-ranked Oklahoma City which shot 557 over the opening two rounds. The top two teams in the country will do battle Tuesday to see if either can come out on top of the field which features several teams ranked in the Top 25 poll. "We need all hands on deck to finish tomorrow," said Coastal Georgia coach Mike Cook. Coastal Georgia standouts Eli Scott and Mark David Johnson also will be in the chase for the individual crown in Tuesday's third and final round. Scott, a freshman, will start the day, tied for the lead after posting a 7-under-par 133 score over the 36 holes on Monday. Scott shot 2-under 68 in the first round and followed that with a 5-under 65 in the afternoon round to grab a share of the lead. The Coastal Georgia freshman is tied atop the leaderboard with Carter Lewis of Ottawa University who also shot 133 over the first 36 holes. He carded a 66 in the morning and a 67 in the afternoon. Meantime, Coastal Georgia's Mark David Johnson trails Lewis and Scott by a stroke going into round three. The senior from St. Simons Island opened with scores of 69 and 65 to shoot 134 on Monday. The top five players on the leadeboard are separated only by three strokes going into Tuesday's final round. On Monday, the Mariners opened with a 284 score on the par-70 Lakes Course before posting a 270 score over the second 18 to jump from fourth to first on the team leaderboard. The 270 was the low round by all teams on the tournament's first day. It also is the lowest-ever score by a Coastal Georgia team in a single 18-hole round. The previous low was a 272. However, that previous low total was a 16-under-par score on a par-72 layout. In relation to par, the 10-under tally in Monday's second round ties for the fifth-best score by a Coastal Georgia squad in the program record books. The top-rated Stars opened with a 272 in the morning to grab the early lead before posting a 285 in the afternoon round to finish the first day three shots worse than the Mariners. It's not like the third round will be a two-team battle for the crown, though. Several other teams have a shot at the championship including Johnson & Wales which competes in the Sun Conference with Coastal Georgia. The Florida school shot even-par 280 in both rounds on Monday to post 560 for the day which leaves it just three strokes behind the Stars and six back of the Mariners. Rocky Mountain College also shot 560 over Monday's play and is tied for third. Keiser, another Sun Conference school, is tied for fifth at 562 along with Victoria (BC). Also for the Mariners on Monday, Kyle Kidd shot 70-73-143 to tie for 30th, Jackson Lawlor carded 77-71-148 to tie for 62nd and Chip Thompson shot 79-69-149 to also tie for 62nd. The Mariners have won five of the six tournaments they have played in over their fall and spring schedules including their first two tournaments of the spring season. Originally published at Coastal Georgia Sports.